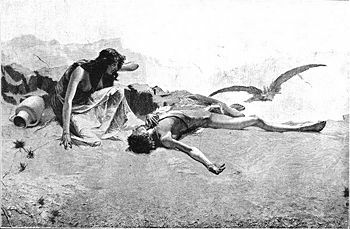 Ishmael faces death in the wilderness. Ishmael (Hebrew: יִשְׁמָעֵאל, Yišmaʿel, Arabic: إسماعيل, Ismā'īl; "God will hear") was Abraham's eldest son, born by his wife's handmaiden Hagar. In Islamic tradition, he was the ancestor of the prophet Muhammad and the son whom Abraham offered as a sacrifice to God. In the Book of Genesis, Ishmael was the first of Abraham's household to undergo the rite of circumcision. 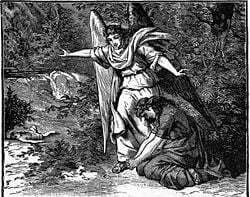 Later, Ishmael and his mother were banished to the wilderness at God's command after Abraham's primary wife came to view Ishmael as a threat to her own son, Isaac. Suffering from lack of food and water, Ishmael almost died there but was dramatically rescued by God. He went on to become the ancestor of the biblical Ishmaelites. He returned to join Isaac in burying Abraham and later permitted his daughter to marry Isaac's son Esau. Judaism has generally viewed Ishmael as wicked in youth but repentant in adulthood. Islamic tradition ascribes a larger role to Ishmael, viewing him as a prophet, and the son of sacrifice. Both Jewish and Islamic traditions consider Ishmael as the ancestor of the Arabs. Many people today regard the Arab-Israeli conflict to have its roots in the ancient conflict between Ishmael and Isaac, or more precisely, between their mothers Hagar and Sarah. 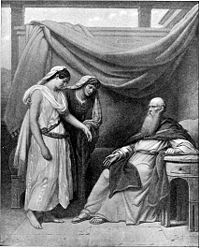 Sarah presents Hagar to Abraham. toward all his brothers" (Genesis 16:10-12). Abraham fell facedown; he laughed and said to himself, "Will a son be born to a man a hundred years old? Will Sarah bear a child at the age of ninety?" And Abraham said to God, "If only Ishmael might live under your blessing" (Gen. 17:17-18). "Yes, but your wife Sarah will bear you a son, and you will call him Isaac. I will establish my covenant with him as an everlasting covenant for his descendants after him. And as for Ishmael, I have heard you: I will surely bless him; I will make him fruitful and will greatly increase his numbers. He will be the father of twelve rulers, and I will make him into a great nation. But my covenant I will establish with Isaac, whom Sarah will bear to you by this time next year" (Genesis 17:19-21). Abraham initiated the tradition of circumcision immediately afterward, with himself and Ishmael being the first to undergo the rite. Expulsion of Ishmael and Hagar, by Gustave Doré. Ishmael, now a teenager, was thus forced to leave his home and go with Hagar into the wilderness near Beersheba. Soon, their supplies ran out, and Ishmael grew weak to the point of death. God saves Ishmael from death. Unable to bear watching her son die of thirst, Hagar left him under a bush and walked "a bow-shot away." The boy's pathetic cries, however, were heard by God. Then a voice from heaven said to his mother: "What is the matter, Hagar? Do not be afraid; God has heard the boy crying as he lies there. Lift the boy up and take him by the hand, for I will make him into a great nation." Suddenly, a spring of fresh water appeared before Hagar's eyes, and thus both she and her son were saved (Genesis 21:15-19). Ishmael and Hagar settled in the area known as Paran, northeastern part of the Sinai peninsula. Ishmael became an expert in archery. Later, his mother found an Egyptian woman to be his wife. 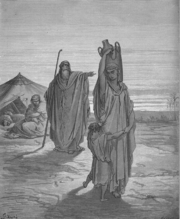 In biblical tradition, the Ishmaelites were a clan of traveling merchants. In the story of Jacob's son Joseph, a group of traveling Ishmaelites buy Joseph from his brothers as a slave and then sell him in Egypt. They are described as quite wealthy: "Their camels were loaded with spices, balm and myrrh, and they were on their way to take them down to Egypt." Judaism has generally viewed Ishmael as wicked in youth though repentant in later life. His behavior against the toddler Isaac is specified as more than merely mocking, but directly threatening Isaac's life. In one tradition, Ishmael lured Isaac to the fields where he cast arrows at him, in order to get rid of him (Gen. R. 53). It was for this reason Sarah insisted on Ishmael and his mother being sent away. The ancient rabbi Simeon ben Yohai, stated that Ishmael refused to accept that Isaac would be Abraham's chief heir, maintaining that he (Ishmael) should receive two-thirds of the inheritance (Pirke R. El. 30, and so on). Another rabbinical legend tells the story of how Ishmael claimed to be better than Isaac on account of having willingly allowed himself to be circumcised (Sanh. 89b; Gen. R. 56:8). Another tradition holds that Abraham visted Ishmael in Paran, and in Abraham's old age, Ishmael came to live with his father again in Canaan. Ishmael is also mentioned in the Book of Jasher, which states (chapter 25) that the sons of Ishmael were "twelve princes according to their nations." Both Jewish and Christian tradition held that Ishmael was the ancestor of the Arabic peoples. Saint Jerome stated that in his time they called the districts of Arabia by the names of the Ishmaelite tribes mentioned in the Bible. Modern scholars, however, tend to see the Arabs as more diverse in ethnic background, viewing their Ishmaelite origin as more legendary than historical. In Islam, Ishmael is known as the first-born son of Abraham (Ibrahim in Arabic), and is also an appointed prophet of God. Islamic tradition holds that Ishmael, not Isaac, was the son whom Abraham offered to God as a human sacrifice. Ishmael is also the ancestor of the prophet Muhammad and the Arab people generally. We have sent thee inspiration, as We sent it to Noah and the Messengers after him: We sent inspiration to Abraham, Isma'il, Isaac, Jacob and the Tribes, to Jesus, Job, Jonah, Aaron, and Solomon, and to David We gave the Psalms. 4:163). Isma'il enjoined upon his people worship and almsgiving, and was acceptable in the sight of his Lord (19:55). Meccans, and many Arabs at the time of Muhammad, believed that Isma'il settled in Mecca, was their ancestor. Abraham and Isma'il are said to have built the foundations of the Ka'aba (2:127). The story of Isma'il and Hagar (Hajar in Arabic) plays an important role in Islamic tradition. Each year during the Hajj (the ritual pilgrimage) in Mecca, pilgrims reenact Hajar’s desperate search for water for her infant son, running seven times between two hills and drawing water from the well of Zam Zam, said to have sprung miraculously from the dry earth at the baby Ishmael’s feet. The actual name of the son whom Abraham was supposed to sacrifice to God is not mentioned in the Qur'an. However the belief that this son was Isma'il is now well established. When Isma'il had grown enough to walk alongside him, Abraham dreamed that God ordered him to sacrifice his only son (Isaac not being born yet) with his own hand. Abraham knew that the dream was, in fact, a revelation from God and not a satanic whisper; so, he prepared himself, with a heart overflowing with faith, to carry out the command of God. He went to see his son and told him, "I saw in a dream that I sacrificed you for the sake of God. Think about it and tell me your opinion on the matter." His son replied without hesitation or anxiety, "O father, fulfill what God has commanded. By His will, you will find me among the patient." Dear father, tie my hands and feet tightly with a piece of rope so that I don't move them as I am dying, because I am afraid that I would lessen my reward. Keep your clothes away from me so that my blood doesn't splatter on you; if my mother sees that, she may not be able to tolerate it. Sharpen the knife well and sever my head at once so that I can tolerate it better, because dying is difficult. Abraham replied, "Dear son, you are a good assistant in fulfilling the command of God." He put the knife to his son's throat and, with all his strength, tried to cut; but by God's will, the knife didn't cut and didn't harm his son. Abraham received a revelation from God: "O Abraham, truly you have done your duty, fulfilled the meaning of your dream and shown your submissiveness and devotion." God then sent the angel Gabriel with a ram, which Abraham sacrificed instead of his son. Later, Ishmael became friendly with the Jorham tribe and married a chaste woman of that people. Hajar died in that same land after a few years. Isma'il was deeply affected by the death of his devoted mother and became very distressed and sad. Abraham continued to go there to visit him; and this consoled Ishmael somewhat. ↑ Islam 101, Trial of Sincerity. Retrieved April 21, 2007. ↑ Ummah.net, The Prophet Isma'il. Retrieved April 21, 2007. ↑ Muhammadanism.org, Geneaology traced to Adam. Retrieved April 21, 2007. Bakhos, Carol. Ishmael on the Border: Rabbinic Portrayals of the First Arab. State University of New York Press, 2006. ISBN 9780791467596. Heap, Norman. Abraham, Isaac and Jacob: Servants and Prophets of God.'. Family History Pubns, 1999. ISBN 9780945905028. Kaltner, John. Ishmael Instructs Isaac: An Introduction to the Quran for Bible Readers. Michael Glazier Books, 1999. ISBN 9780814658826. The Jewish Encyclopedia: Ishmael. www.jewishencyclopedia.com. 'The 12 Tribes of Ishmael'. www.nabataea.net. This page was last modified on 6 March 2018, at 23:17.